Unsheathing this beast of a power supply is a pleasing process. Clad in gunmetal grey armour, and sporting a cooling fan the size of Bolton, it's clearly a high-performance product. The modular cabling can handle a massive number of components - with four PCI-Express six-pin plugs, and enough four-pin plugs for a pair of CPUs, your options are broad to say the least. And a mere 100W less than Enermax's 850W Galaxy unit, it's nearly as capable, and literally half the size. But it's what inside that really counts. Along with Active PFC (and to be honest, you should expect efficiency-raising Power Factor Correction from any respectable PSU these days), Enermax uses a system called CoolGuard. If the PSU is running above 45ºC when the PC is shut down, it keeps the case fans running a little longer to dissipate the heat properly. 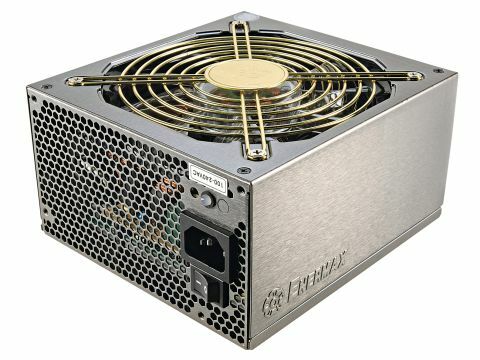 Moreover, this PSU is powerful enough to run a very meaty rig indeed, without the £200-ish premium of many high-end PSUs. We happily had a test rig sporting a Kentsfield and an 8800GTX running, and we reckon there's a whole heap of headroom beyond that. Compact, flexible and high output - what's not to like?